The Colchester + Ipswich Museums Service is entering an exciting time of change and development. Supported by public funding through the Heritage Lottery Fund’s ‘Skills for the Future Programme’, the service – together with project partners The Long Shop Museum, Museum of East Anglian Life and Palace House: National Centre for Horseracing and Sporting Art – is opening-up new ways for people to participate in museum activity through the Transforming People to Transform Museus project. The aim of Transforming People to Transform Museums is to provide paid trainee opportunities that open-up career pathways into the museum/heritage sector and help create future museum environments that better reflect and represent local communities. Therefore, each museum partner welcomes applications from local people, aged 18+, with a GCSE in English (or equivalent) and no paid museum experience, to join their teams in discovering, interpreting and sharing museum stories and collections. 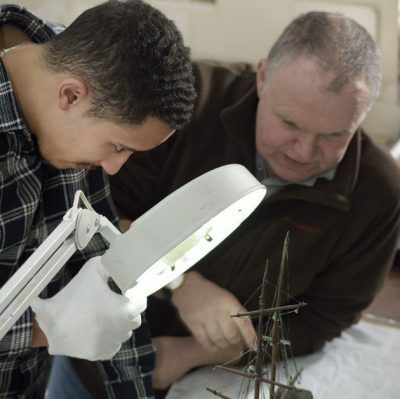 Trainees will gain focused experience of museum practice, together with transferable business skills and new perspectives on how museum collections connect withcommunities. Successful trainees will receive a bursary of £14,400 per year (paid monthly) and will be expected to complete a Level 3 Diploma in Cultural Heritage, which provides not only financial support throughout the project but a solid foundation from which to pursue a future career. All trainees will be part of a full-time training programme, which includes training and travel across multiple sites and covers a 7-day rota that may include evenings, weekends and bank holidays. Applications are open now! Colchester + Ipswich Museum trainee application forms are available via the Colchester Borough Council website: https://www.colchester.gov.uk/jobs/ and applications for the other trainee roles are available on each museums’ website. Applicants are welcome to apply for multiple roles. The second stage of recruitment will ask long-listed candidates to participate in a short filmed interview via an online link. At the final stage, short-listed candidates will be invited to an Assessment Day at the relevant museum, details of which can be found on all application forms and on each museums’ website. For further information, please contact Project Officer, Taryn Dennis: transform.museums@colchester.gov.uk / 01473 433568.